#2. “Sure, that works for them, but that wouldn’t work for me.” We often believe that other people are just lucky or special, that they were born with some innate quality that we lack. The truth is that they just tried different strategies than you, and perhaps longer. You just have to put in the miles. It’s not that you lack the requisite strengths or talent to win; it’s that you need more focus, time, training, mentorship — all things you can control. Never make your mission or your dream bow down to your current limited strengths. Grow into the person you need to be to serve. #3. “You just don’t understand.” This story allows us to build a wall to protect ourselves because we don’t want to be vulnerable or because our communication hasn’t been effective in the past. It also shuts down a conversation faster than anything. If you really believe people don’t understand, then your ego has a hold of you. You won’t ask for help. You basically ensure your own failure because in silence there is suffering. People can understand. Share your ideas. Ask for help. Seven billion people on the planet my friend – you’re not alone. Here’s the four dumb things we say that prevent our own personal growth and professional excellence. We all have internal thoughts that sometimes slow us down. I’m sure you sometimes experience negative thinking. Sometimes, you say things to yourself that justify bad behavior, laziness or distraction. We all do. We say certain things that we just culturally get used to saying, but that are ultimately hurting our personal and professional development. So, what I want to do is dig down into these four dumb things we say to ourselves. I know that once you hear a little logic behind them, you’re realize that these things aren’t the whole truth and are only holding you back. Before we dive into the four dumb things, I want you to think about a big dream of yours. This dream is something that you really care about, and may be a goal that you haven’t yet achieved or that you’re struggling to achieve. And because they tried one, two, three, or even four things, they immediately begin dismissing any other ideas that come forward as impossible. As a high-performance coach, often when I sit down with people, I talk about their dreams. In response, they often tell me that they’ve tried everything in order to achieve that goal, without success. That’s when I ask them to show me the list. If you tried everything, then of course you would have had to keep a detailed list of what you tried, when you tried it, what results you got, what worked and what didn’t work. If you didn’t have a list like that, then you couldn’t ensure that the options you tried were mutually exclusive. And if it isn’t clear if your options are mutually exclusive, then you wouldn’t really know if you’ve tried everything. So, have you ever told yourself that? Think about how many times in your life you give up too soon. You’re at that 10-yard line, the touchdown’s right there, but you tell yourself that you’ve tried everything, and so you back off. 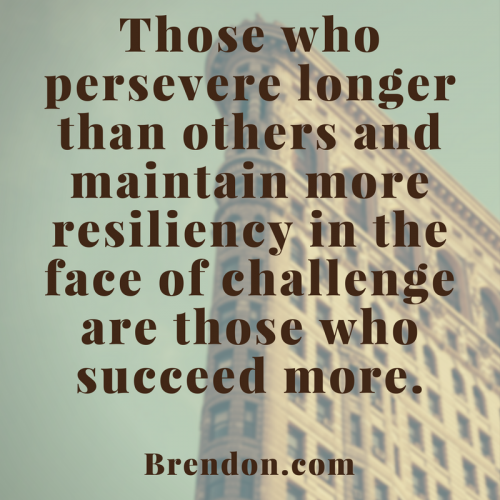 We know from the psychology of success that it’s those who persevere longer than others and maintain more resiliency in the face of challenge that succeed more. So, if you ever hear yourselves saying, “I tried everything”, know that’s a big, bad story you’re telling yourself. It’s time to realize that you haven’t tried everything. When we acknowledge that we haven’t tried everything, then we become open to asking for advice from others, as well as tracking the options we have tried and the results we’ve seen so far on our pursuit of our goals. There’s a lot of new things you can try out in order to keep getting ahead. 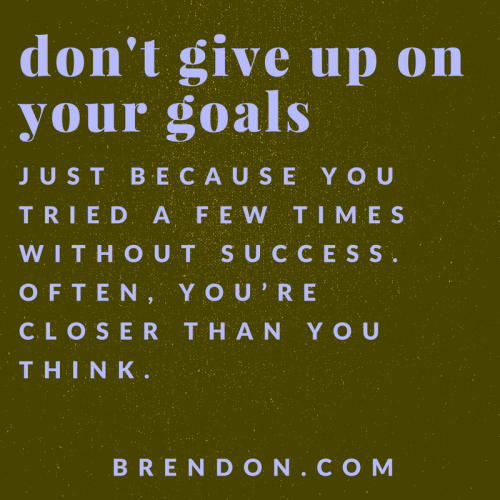 Don’t give up on your goals and your dreams just because you tried four or five things. It’s very true that, often, you’re closer than you think. You have this big goal or dream. You see your mentor, and you see your dreams. They are doing it successfully, but you tell yourself that it wouldn’t work for you because it’s not your style (or, you come up with another reason why you wouldn’t be able to achieve the same goals). We false compare ourselves to others, believing that they’re special. We still pretend that there are some people who just have ‘it’, while others don’t. We believe that others are just naturally good at that, or that they’re born with some special quality that we lack. It’s just not true. But in everything that we study, those who achieve high performance in their life have spent time training, conditioning, practicing. They sucked at first, but they were okay with that. They were cool with not being good, and then, they just kept improving. And now, you watch them today and you believe that you could never achieve what they’ve achieved. The truth is that you can achieve it. 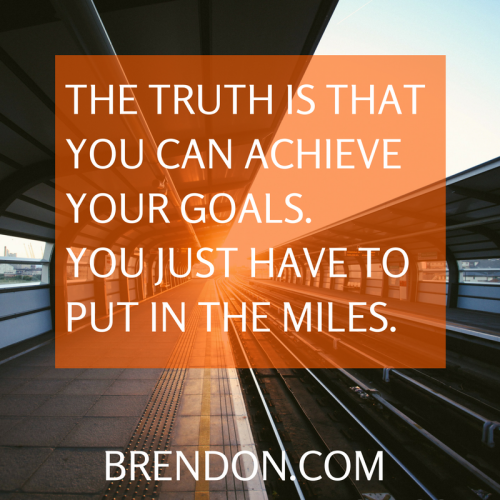 You just have to put in the miles. At the beginning of my career, I used to say that, too. I looked at successful people on television or big YouTubers. I’d see these people on big stages motivating people and I thought that I’m not like that. I started my career as an introverted person and I’ve had to learn to be more and more extroverted in order to serve at the level that I serve. You deserve it. 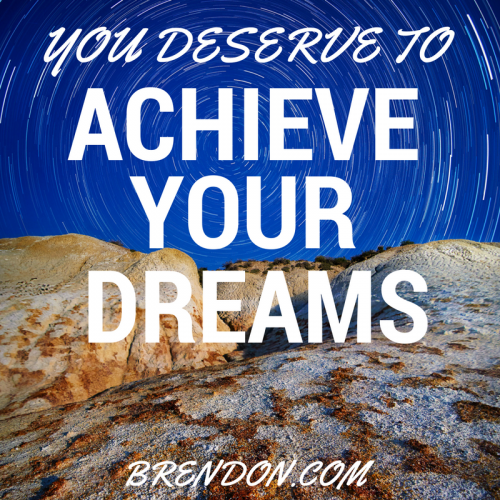 You deserve to achieve your dreams. I’m always trying to improve my skills and grow into the person who I know deserves that dream, who earns that dream. None of your heroes just came out of the womb at the level they are today. They usually outworked their peers. They usually showed up more often. They usually were more strategic in getting a good peer group around them to support them, to champion them, and to push them. If there’s a strategy, you can deploy it. Would you get the same results as someone who has 10 more years of experience as you? Probably not. They put in more more miles, but no matter how small you start, start something that matters. It’s the great Zig Ziglar who taught us that, right? You don’t have to be great to start but you have to start to become great. Never look at people and say, “Well sure, she can. I can’t.” Because that’s defeatist. It is wrong and it is holding you back. #3. “You just don’t understand.” After saying that, people tend to quit. When they say, “I’ve tried everything.” They quit. “Well, she can do it, sure.” They quit. And then they say, “Well, they don’t understand me. You don’t understand me.” They quit. If you think people can’t understand your journey, then your ego has gotten the best of you. There’s 7 billion people alive on the planet right now. Somebody has not only gone through what you’re going through, somebody out there is going through what you are going through right now. The belief that you’re misunderstood indicates that your ego is at play and believes that you’re special. “I’m so special because I’m so great” or “I’m so special because I’m so diminished and so hurt” are two types of stories that end up dividing us from people. This story builds a wall to protect ourselves because we don’t want to be vulnerable or because our communication hasn’t been effective in the past. That was the case for me. In college, I was depressed and suicidal after the breakup with the first woman I ever loved. And I thought, “They can’t understand me. They’ve never had their heart broken like this, not like this”. But we don’t have to go through the exact same things to have human empathy and compassion. When you don’t talk to people about what’s going on, they’re not able to ask the questions to see what support you need. Maybe they can’t help you, but they can understand and find someone who could help you. The more that you hold back, the more that you’re going to be in trouble. Silence is where the suffering is. Claiming that others don’t understand what you’re going through, makes it much less likely that you’ll raise your hand and ask for help. When you go into your little silo and disconnect from others, you’re not living life fully connected with other people who are the ones who could help you in the first place. Everybody can understand you. You need to develop better communication skills to help them understand. If you consistently open up to people about what’s going on in your life with an open mindset, you will find that you get more help in the world. ‘Easier said than done’ is a defeatist statement. When you think about it, everything is easier said than done. So, it’s a stupid universal thing that we say that causes us to stop pursuing our goals or dreams. If you’re struggling and you’re trying to get ahead, examine how these statements work in your life. Do you ever find yourselves saying any of these four statements? Instead of saying, “You don’t understand”, try saying, “I’m struggling right now. I’m wondering if I could share something with you. I’d love to see if you’ve had a similar experience or could give me some advice right now?” Try entering situations with honesty, authenticity and humility. We can all be pessimists in life. It’s easy to fall into that pattern today. There’s a lot of negativity and disturbing information out there. We see it every day. It’s why I and my team spend so much time delivering great personal development training to you as much as we can. I think the world needs more positive thinking. I think people need to believe in themselves. I think they need to believe that they can keep at it, and keep going. I think right now, we all need to remember that we’re stronger than we think, and the future holds good things for all of us. I appreciate you being here. I look forward to seeing you out on the road. Until then, go every single day of your life. Remember, that you can think more positively. Remember, that the world is an abundant place. Remember, that other people need you to rise and lead right about now. And if you remember those things, you can live The Charged Life.